So, in my websurfing, I've come across a grain-free pancake recipe - which I just had to try - because we eat a lot of pancake over and this house. 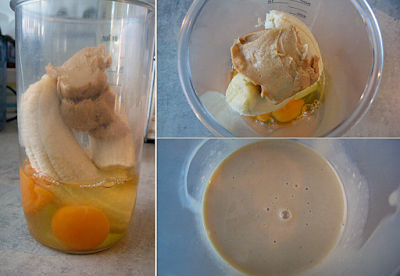 It only has 3 ingredients: eggs, banana and nut butter. Those are things which I happen to have on hand all the time. So this will be easy to try. I have tried it - in the last 5 days, I've had it every day and I love it. I've been trying different combinations as well. One such combination is to serve it together with cottage cheese and blueberries - because I'm trying to avoid excess sugar, syrup and the like. 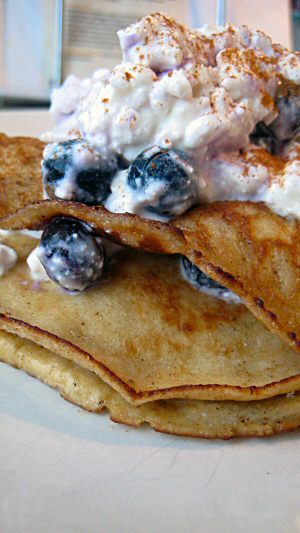 Eating these pancakes together with the cottage cheese and blueberries - is so satisfying - delicious, nutricious and filling! So, I begin the day with my juice, around 10am I have the pancakes and then around 12:30 or 1pm I have my salad - which keeps me feeling full and satisfied till dinner! I only had some watermelon because it was so hot and I usually snack in the afternoon so I didn't want to resort to old habbits and snack on junk food - I had the watermelon - it's watery - it's sweet - it's good. I've tried this recipe using all natural hazelnut butter and also cashew butter. I like it with the cashew butter. I'd like to try it with peanut butter - just because I love peanuts - and I think that would go good with some honey on top... of course it would... but you know, with the banana - it's a pretty sweet pancake - you don't really need to add any sugar, syrup or honey - it's delicious with just some fruit and yogurt or cottage cheese.